You can still purchase a Sovereign Man: Confidential 12M Membership at our usual price. Your email address and newsletter subscription have been confirmed. Any rational person will agree that there's something seriously wrong with the system we're currently living under in the West. And because of that, we have a responsibility to do what's necessary to protect our families and our hard-earned savings from the dangers of out-of-control governments. As you analyze your personal situation and consider the most prudent actions to take, here are a few of the most important questions we help our members answer to protect and grow their liberty and prosperity, no matter what happens next. 1. Are my savings stored in a SAFE jurisdiction and denominated in a strong, stable currency? A smart move is to protect a portion of your hard-earned savings in a safe bank and strong currency overseas. 2. Do I know WHERE to go and WHAT to do if I need to get my family out of Dodge, fast? If your Plan B is missing this vital component, you're subject to your home government's ever-growing overreach. More rules and regulations. More executive orders. More telling you what you can and cannot do. At this point, even martial law isn't out of the question. The time to figure out where to go to protect your family isn't while you're packing your bags. 3. How can I responsibly protect and GROW my wealth without taking on tremendous risk? We're living in an incredibly risky financial environment. If you do nothing with your money other than save it, you'll actually LOSE it (due to inflation). And if you put it into any traditional investment like stocks or bonds, the risk is enormous. Yet, I want to be clear that this message is far from doom and gloom. What I’m showing you in this chart is that the members of our premium service Sovereign Man: Confidential (SMC) have more than TRIPLED their money with just one recommendation… and in less than three months. Sure, you already missed a lot of the upside on this particular investment. But our Chief Investment Strategist believes that there’s a lot of room left to profit from this trade. In fact, we think it could even double from here. And, to be clear, that's just one recommendation. We recently had another recommendation go 4X (over 400%) in the last two weeks. Tracking down these opportunities for our members is what we do. We share these opportunities and the exact steps to take advantage of them in our premium service, Sovereign Man Confidential. Inside, we equip rational, responsible people with the tools and insights they need to make more money, keep more of it, and protect themselves from out-of-control, destructive governments. We're not "international diversification guys". We're not the "offshore bank account" or "second passport" guys, either. But the truth is, Sovereign Man is about so much more than these things. I'd like to briefly show you how we do this on a weekly basis for members of our premium community, Sovereign Man: Confidential. The first tenant of our mission at Sovereign Man is to help our members make more money. I think by now you've seen we're anything but the shameless internet hucksters looking to make a quick dime off unsuspecting patrons. The fact is, we don't have to do this. Our businesses and investments have been very successful. 1. We believe that relationships and investing in people are more important than anything else we could spend our time or money on, and Sovereign Man is the BEST platform to achieve that goal. 2. The value that comes from helping you and thousands of other SMC members implement the same successful, lucrative strategies as us is one of the best and highest uses of our time. Money is nothing more than a thing we can trade in exchange for things that are more valuable. We can trade money for real stores of value like precious metals, ownership of valuable companies, or productive real estate. We can trade one type of money (currency) held in a risky, thinly capitalized bank for a strong currency in a well capitalized bank in a stable jurisdiction. We can trade money for a chance to make a lot more of it, by investing in a profitable, well-run business. And we can even trade money to increase our freedom - to establish residency abroad, obtain a second passport, and so on. See, it's BECAUSE money is an essential tool to increasing your freedom that we publish recommendations to help our members make more of it. One valuable component of SMC Membership is investment recommendations from our Chief Investment Strategist, Tim Staermose. Buy companies that are WAY undervalued, and sell them when they become overvalued. Many of his recommendations are for companies he finds trading at valuations of less than the cash they have in the bank. Frankly - it's hard to LOSE money with companies like this. And if you have a long term, unemotional approach, it's easy to MAKE money with companies like this. Of course, finding these deals is the hard part. And Tim has done an extraordinary job for SMC Members. So what's the track record of the recommendations you'll find inside SMC? If you had invested in all recommendations so far over the past 2.5 years, you'd be up about 57%. Meaning with a portfolio of only $1,500, you'd have earned back more than the cost of SMC membership. Of course, we publish other opportunities to make more money inside the pages of SMC as well. But in many cases, one of the fastest, easiest ways to earn a high return is to KEEP more of the money you make. This means taking every legal action available to reduce, defer, and even eliminate a substantial portion of your tax bill each year. For example, in a recent SMC Alert, we showed US taxpayers how to take the first $100,000 they make each year, tax-free. - You can move your business to Puerto Rico and pay just 4% in corporate tax. And by moving there yourself, you can avoid paying any tax on capital gains and dividend income. - You can shift your business overseas to radically reduce corporate taxes (US corporate tax is one of the highest in the world). - You can ship your IRA overseas to defer your taxes and take full control of how your retirement savings are being invested. - You can utilize double-taxation agreements to receive your pension income tax-free while living abroad, as well as to reduce, or completely eliminate, your corporate and personal taxes. Long ago I realized that every penny I paid to the federal government was being squandered on waste, debt, and war. I was effectively footing the bill to send more guys overseas to get their legs blown off...to fill more offices with more suits who come up with more regulations to make my loved ones and me less free. And I knew that I had to do something about it. I couldn’t in good conscience continue to support such mindless destruction. As a result, I'm able to spend my money on things that actually matter...things that make the world a better place. - Each summer, we host a free liberty and entrepreneurship camp for sharp, motivated young people in the countryside of Lithuania. - We're sponsoring an entire village in Nepal after the devastating earthquakes there earlier this year. - We helped a veteran with $80,000 to get a new leg after the US government decided the procedure he needed to walk again was "too risky" (even though they were perfectly fine sending him to Afghanistan where his leg got blown off). Look, these are just a few examples of what you can do when you keep more of what you earn. We're fond of saying:"Don’t put all of your eggs in one basket..."
Inside SMC, you'll find unique strategies and specific, step-by-step guides to diversify your assets and life internationally so you can protect everything you've worked for. What we really do at Sovereign Man is help you build a Plan B. Your Plan B is full of solutions that make sense no matter what happens next. And some are offensive strategies - particularly the investing recommendations you'll find inside, business and real estate opportunities we discover in our travels, and much more. In a moment, I'll show you how you can get access to each of these Intelligence Reports. PLUS, you'll qualify to get our Offshore Trust Kit (a $295 value) and Globalize Your Gold Black Paper (a $49 value) for FREE when you activate your Sovereign Man: Confidential membership before May 31st at midnight. As much as it seems like the politicians are trying, the world isn’t coming to an end. Those who understand how it’s changing will be in very advantageous position. More freedom and more prosperity starts with education and insights. These insights are what we empower our premium subscribers with to help them make more money, keep more of it, and protect themselves from out-of-control governments. Strategies like obtaining a second passport, establishing an offshore company or trust, foreign banking, and frontier investing. A quick and easy “international diversification blueprint”. It’s a collection of actionable videos and step-by-step guides to help you break free from a failing system so you can increase your liberty and protect yourself and your loved ones. You’ll get access to numerous videos showing you specific Plan B solutions. These videos will give you step-by-step instructions and our vetted contact information to implement these strategies from the comfort of your own home. 1. How to Establish an Extremely Safe Offshore Bank Account. This simple step to store some of your savings in an offshore bank ensures that no matter what happens to the banks in your home country, you’ll have some money stashed away in a safe jurisdiction and a strong currency. You'll get direct access to the Managing Director and CEO of two banks who will show you exactly how to open a bank account in two extremely safe jurisdictions (The Cook Islands and St. Lucia) in the currency of your choice. Both banks have astounding levels of liquidity and are extremely well capitalized - they're literally over 20-TIMES stronger than the shaky Western banks that had to be bailed out just a few years ago. You’ll learn how you can easily acquire an official resident visa in Panama -- a thriving and exciting country. Having foreign residency has numerous benefits, including an easier way to open financial accounts, conduct business and invest in that country, taking advantage of the cheaper cost of living and other lifestyle opportunities if you decide to spend at least some time there, as well as potential tax benefits. Having a resident visa also ensures that you’ll always have a place to go if you decide it’s time to leave your home country. The best thing about having residency in Panama is that you don’t have to spend practically any time there in order to maintain your residency, which gives you a lot of flexibility. And after just 5 years, you can qualify to become a naturalized Panamanian citizen and get yourself another passport. Most precious metal storage providers are not even close to being secure. This company is unique, however. Their entire operation was designed to ensure that clients have complete insight into what’s going on with their bullion (including testing it with three different methods to verify it’s authenticity!) while maintaining their privacy. You’ll learn how you can move your existing bullion to one of the safest locations in the world (that almost nobody knows about), or buy new bullion and store it in their vaults. Plus, we'll show you a unique, peer-to-peer lending investment opportunity backed by gold! 4. Ship Your IRA Overseas So That Your Retirement and Investments Are Safe From Your Home Government. When governments get strapped for cash, their go-to move is to reach for people’s retirement savings. It happens all the time, and it can happen surreptitiously by way of hidden clauses and fees that your retirement custodian (a.k.a. Big Wall Street Banks) will never tell you about. With the help of our tax attorneys, trust experts, and private bankers, you’ll learn how to take control of your IRA yourself, move it overseas, and secure your retirement fund. Plus, you'll receive these bonuses FREE. You're protected by our 30 Day No Questions Asked Guarantee. If you're unsatisfied for any reason, simply email clients@sovereignman.com within 30 days of purchase and we'll provide you with a prompt and courteous refund. If you get started with Sovereign Man: Explorer today, you'll also get 5 keynote speeches from our live events in Chile and Mexico. Attending our seminars in person costs $2,000+, but you'll get to hear from our most celebrated speakers for FREE. Peter Schiff, Jim Rickards, Robert Kiyosaki, Ron Paul, and Tim Price delivering keynote speeches. You'll get each speech FREE when you get Sovereign Man: Explorer today. Keynote #1: Peter Schiff has a track record few can boast about. In this speech he shares his insights on how people in the U.S. can not only protect their assets, but PROFIT as the U.S. deteriorates. Keynote #2: Jim Rickards will share with you insights from his 35 years of experience as an investment banker on how to act as the continuing debasement of the world's major fiat currencies plays out. Keynote #3: Robert Kiyosaki, best-selling author of Rich Dad, Poor Dad has taught millions of people how to escape the rat race. In this keynote speech, you’ll learn how to work the system to increase your wealth. Keynote #4: Ron Paul has spent decades in politics. He reveals the biggest threat facing ordinary people in the coming years and how to protect yourself from it. Keynote #5: Tim Price is an investment manager and editor of Price Value International. He unequivocally and wittingly shows how overpriced the bond and stock markets are in the West right now, and shares his personal value investing strategies so that you can come out on top. I’m committed to giving you everything you need to immediately begin protecting your hard earned wealth and increasing your personal freedom. My name is Simon Black. I'm the founder of Sovereign Man: Confidential, an international entrepreneur and investor, and a free man. I travel the globe looking for personal and economic opportunities to enrich my life and the lives of our subscribers. Simon Black at our Sovereign Man Offshore Tactics Workshop in Santiago, Chile, in 2013. with Peter Schiff, Nigel Farage, Ron Paul, Jim Rodgers, and Jim Rickards. Sometimes this means a great investment, an exciting business venture, beautiful places to live, or new relationships. Prior to becoming an entrepreneur and investor, I graduated from West Point and became an Army Intelligence Officer. After my time in the military, I became a permanent traveler. That means I have no home, and I am free to move about the world at my discretion. I believe that my capability to make money and enjoy a fulfilling lifestyle is not constrained by my geography. It’s not 1984 anymore. I’m a student of the world, and I believe that travel is the greatest teacher. My knowledge is practical and hopefully of significant use to you. Off the top of my head I could quote you the price of beachfront property in Croatia, where to bank in Dubai, the best place to store gold in Singapore, which cities in Mexico are the safest, which hospitals in Asia are the most cost effective, and how to find condo foreclosure listings in Panama. I believe that in order to achieve true freedom, you have to make money independently, control your time, and eliminate the mindset that you are subject to a corrupt government that is bent on degrading your personal liberty. Are you sick and tired of the IRS taking a huge chunk out of your paycheck – and every dollar your investments earn? Now there’s an effective and perfectly legal way to fight back, protect your wealth, and keep your financial privacy safe from prying eyes: establishing your own offshore trust. Offshore trusts also offer protection against lawsuits, and make no mistake, a single lawsuit could wipe out every dime you’ve saved. It’s too easy for someone sizing you up for a lawsuit to learn the details of your bank account, your investments, and how you spend your money. Now, if the thought of creating an offshore trust intimidates you, it really shouldn’t. For setting up your own offshore trust is surprisingly simple. You can do it without hiring a lawyer or spending thousands in legal fees. Of course, there are specific forms you need to complete to establish your trust – and they must be filed correctly. But we make it incredibly EASY for you, inside. With your permission, I’d like to send you a FREE “Financial Offshore Trust Kit” that contains all the forms with clear, simple instructions for their completion – no special expertise or attorney required. Get the forms today, and you can begin enjoying the financial advantages of an offshore trust within a few weeks. 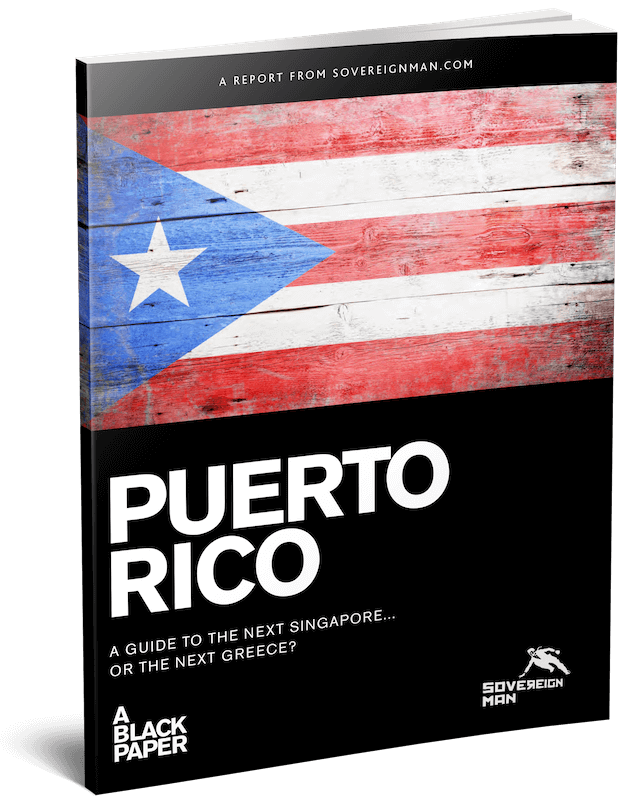 The Foreign Banking Black Paper is our fast-track guide for moving your money to an ultra-secure bank overseas. Now, you can quickly avoid the inevitable consequences of your home country's debt-fueled decline by simply moving a portion of your savings to safety. This Black Paper is not included with the other SMC Black Papers and is sold separately for $47 (though the actual value is much more than that if you're serious about taking action). When you join Sovereign Man: Confidential today, you get it absolutely free.